In this article, we are going to review a well-known OLAP technology and an application developed for better exploitation of an OLAP cube - CubesViewer, which function is already installed in Ranet OLAP. If you had ever wondered what is a cube in BI in general and want to define OLAP cube you will likely find the answer here. Big data analysis and relevant information representation imply business intelligence technologies aimed at better business execution, analysis, and planning. One of such business intelligence technologies constitutes an OLAP system (Online Analytical Processing). This technology is based on a multidimensional structure of data; the structure itself has a form of an OLAP cube. Let’s also take a closer look at OLAP and data cubes basis. Multidimensional OLAP cubes used in OLAP technology are the basis of data storage and organization. The OLAP cube definition entails that the cube comprises all the data in a snowflake or in a star schema whose middle is a table consisting of data aggregations and reconciling various dimensions. The dimensions include information about the aggregations and how they can be analyzed. The multidimensional OLAP cube is called a hypercube if it involves more than three dimensions. MOLAP is considered to be a standard form of OLAP and as a rule, mentioned as OLAP. In this OLAP cube example data is stored in a multidimensional array but not in a relational database. The system requires pre-computation before being run. In contrast to classic OLAP, ROLAP operates explicitly with relational databases and doesn’t need pre-computation. Nevertheless, the OLAP cube database has to be thoroughly drawn up to be exploited in ROLAP. HOLAP, as the name implies, is a hybrid of MOLAP and ROLAP reconciled. This type lets users specify which amount of data will be stored in MOLAP and in ROLAP respectively. The OLAP cubes operate through MDX queries, which are implemented almost instantly. Due to numerous dimensions of the OLAP cube the query defines dimension members to indicate a particular cell which contains all requisite data for analysis or planning. Beyond that, due to the techniques of building OLAP cubes, their structure makes it possible to rotate the cube and see the data from various perspectives and foresee the market trends. There are far more OLAP operations besides rotate (pivot) that can be applied to the OLAP cube. Most frequently used are drill-up, drill-down and slice-and-dice. Drill-up is a technique which permits to merge data aggregations which can be clustered as superfluous. Drill-down vice versa enables a user to see more detailed data by adding a new dimension or by deploying a concept hierarchy in a dimension. Slice and dice for their part are the operations to allow extracting a certain data set and look at it from different perspectives. 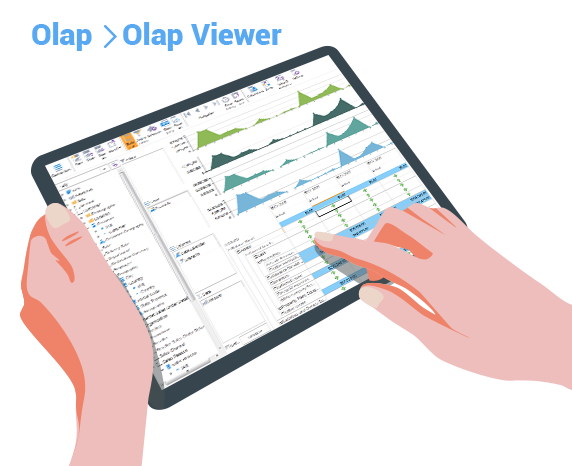 Furthermore, there are plenty of supplementary tools for OLAP such as nesting, blending and a viewer function which is described below. While operating with the OLAP cube data there is a need to compose MDX queries and create current reports. MDX queries are indeed considerably challenging to be created single-handedly and tested afterwards, given the correlation of relations. In addition, for successful report preparation, a user must navigate the data in a meaningful way and be aware of the way how to compile all relevant information. For this aim, there is a CubesViewer, a visual tool to analyze and deal with data in an OLAP system, developed to run in a browser. Ranet OLAP offers a function of a CubesViewer which will help a user to explore the data, design, generate and embed charts. Due to the viewer, the charts and dynamic analytics can be subsequently displayed on all the websites and applications as an HTML version of Ranet OLAP can be used in any browser. Owing to operating in the browser chosen views can as well be saved and shared. CubesViewer built-in Ranet OLAP affords even non-professional users an opportunity to examine data from various dimensions and aggregations, create complex queries and draw up sophisticated reports. Thanks to the viewer it’s easier to leverage raw facts, data series, and charts. The viewer embedded in our system will not require any additional installation or space.